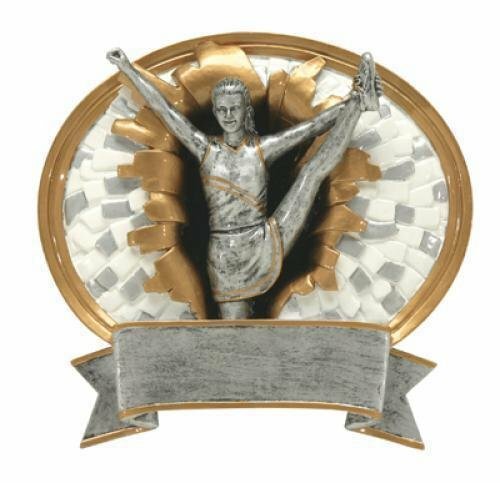 Stylish design along with lots of detail makes these Signature Series Cheerleader Awards a great choice. The cheerleaders are shown with one pom pom at her hip and the other raised in the air so you can almost hear her yell "GO TEAM"! 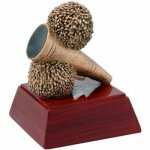 Great flexibility is provided with these awards as they are available in a choice of gold or pewter finish, as well as two heights 8" and 10 1/2". The base on these awards provide plenty of room for whatever your personalization needs may be. These awards will be perfect for your next cheerleading event. 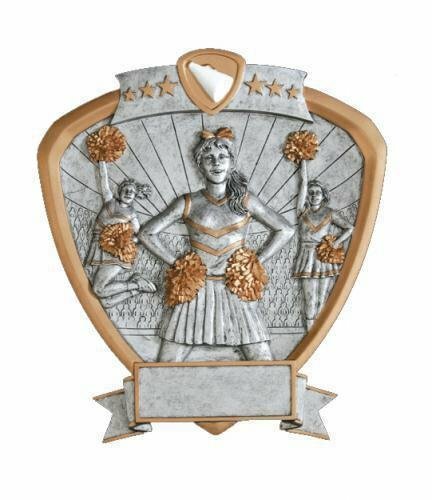 Lots of action is packed into this Signature Series Cheerleader Shield Award. 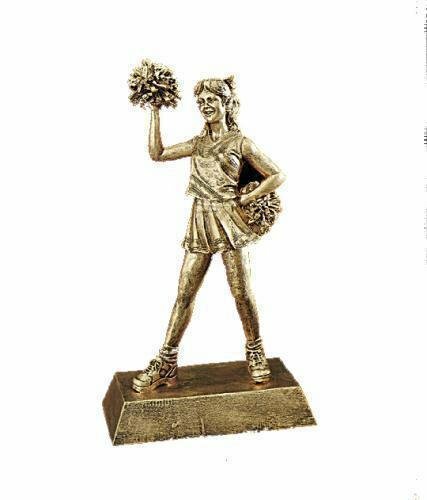 The Cheerleaders in the award are raised providing a 3-dimensional look and are shown holding pom poms in a variety of poses. These shield awards measure 8" X 8 1/2". A large area at the bottom of the award can accommodate your personalization needs while the gold and pewter finish complement the look of the award. This item can either be hung on a wall or placed on a desk using the included stand. This elegant Star Power Cheerleader Award combines the icon of a star and cheerleader in a rich black and gold tone finish. The cheerleader is show with her leg and arms in the air celebrating that game winning score. 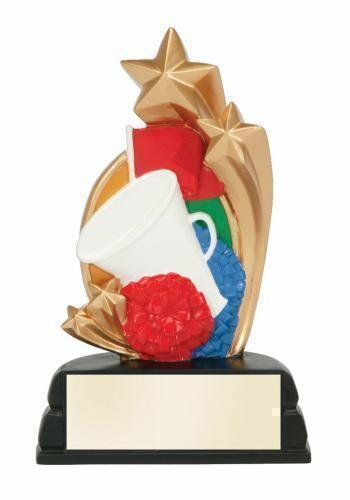 This award stands 7" in height while the base on these awards provide plenty of room for whatever your personalization needs may be. 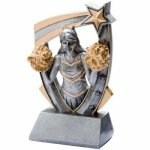 This cheerleader award is sure to be a bring smiles to you next awards ceremony! 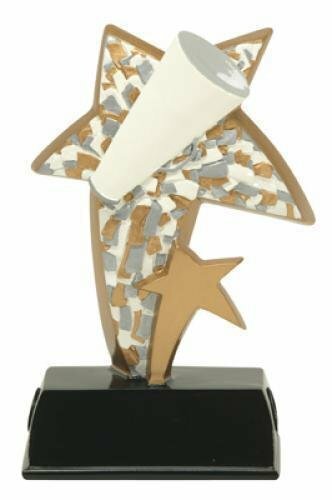 This 3D Star Cheerleading award has a very unique design. 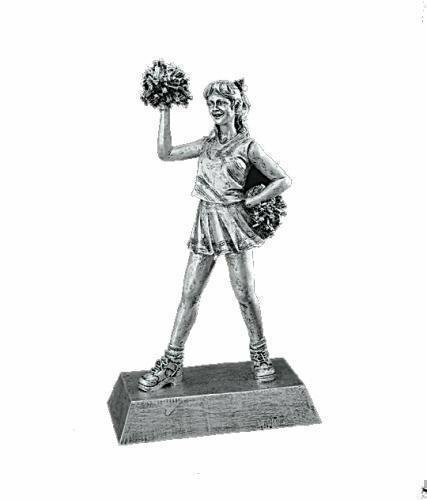 This cheerleading trophy comes with a brushed gold laser engraved plate. 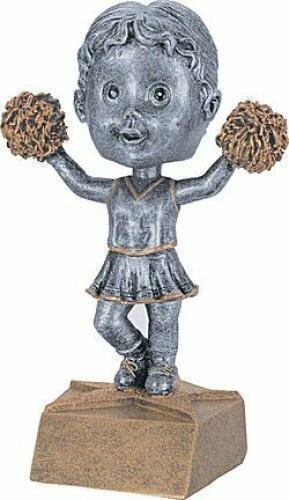 This Cheerleader Bobblehead resin award is arguably the most adorable bobble head on the market. It comes with a brushed gold laser engraved plate.